If you’re a Sudoku Xtra reader you’ll have seen these in their regular 9×9 form in both issues 5 and 6, but this is the first time I’ve made a Samurai one, and the first time I’ve posted one here I think. This is essentially a regular Killer Sudoku puzzle, except that instead of placing 1 to 9 you must place -4, -3, -2, -1, 0, 1, 2, 3 and 4 into each row, column and bold-lined 3×3 box. 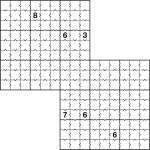 There are also two overlapping 9×9 grids to solve simultaneously. As in regular Killer, the values in each dashed-line cage must sum to the given total, and you cannot repeat the same number within any one cage. It’s been quiet here recently – much of my effort has been going on my UK General Election site, How To Vote, although Sudoku Xtra 6 was out on Saturday too. Anyway, there are still 10 days to go to the election but after that I’ll get some time back! However I thought I should finally post another puzzle – so here one is. Place 1 to 6 in each row, column and 2×3 box (rows and columns are defined by the three underlying 6×6 grids, which you have to infer from the stepping). Also place numbers so that the value at the top-left of each dashed-line cage results from applying the operation between all the value in that cage. For subtraction and division start with the largest value. 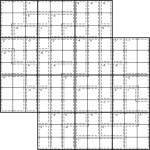 I’ve been posting a few new varieties of Sudoku puzzle in the daily puzzle section of PuzzleMix (i.e. the subscription section, which costs less than £1 a month for well over 1,000 puzzles a year). These aren’t especially unusual variations, but I’ve done a few different mixes (e.g. 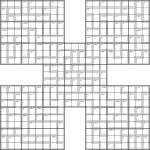 Sudoku-X 12×12 and Wraparound Sudoku 6×6), and I thought it was about time I posted a new mix here too. 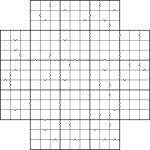 So here’s a 3-grid Samurai Calcudoku puzzle. 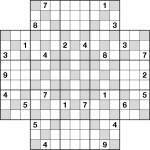 You must place 1-6 in each of the 3 underlying 6×6 grids – I’m afraid these aren’t marked explicitly so you might want to draw in where the grid borders go so you don’t forget whilst solving. Other than that, also place numbers so that the number given in each bold-lined cage results from applying the given operator between the numbers in that cage. Start with the highest number for division and subtraction. There is no restriction on repeating numbers in cages. For each Calcudoku region just place numbers such that the total after applying the stated operation between the numbers in the region is the one given. For example, 7+ could be solved by 3 and 4 (3+4). For subtraction and division start with the largest number in the region, so 1- could also be solved with 3 and 4 (4-3). 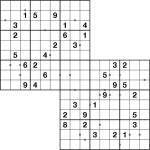 Just to make it really clear, there are no 3×3 Sudoku box regions in this puzzle – just the 8 sets of rows and columns. I haven’t posted much here recently because I’ve been spending my time on Sudoku Xtra, so here’s a large puzzle to fill the void a bit. 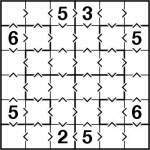 Place numbers into the Calcudoku dashed-line cages to fulfil the results at the top-left of each cage. The given operator when applied between all of the numbers must give the stated result, e.g. the solution to “5+” could be “2+1+2″. For subtraction and division start with the largest number, so for example “3-” could be “6-3″. Numbers can be repeated in Calcudoku cages, subject to the row, column and 3×3 box constraints. Unlike my other puzzles I haven’t used any symmetry in this one, but I’m not sure it’s really that obvious on a puzzle like this one. It’s not especially hard, but with so many places to potentially go it might take you a little while. I’ve started off with a regular 6×6 jigsaw Sudoku, but have added inequalities, just to get you warmed up, then I’ve included my first ever Samurai Inequality Sudoku puzzle, albeit a 2-grid one for now. You’ll notice in both puzzles here that I have included all inequality arrows, so you have far more information than you need – this is deliberate, to make them easier! On the 6×6 puzzle there are five really nice diamond shapes in the centre area, but in general I think having all the arrows is ugly (or lazy!) so I don’t plan to include them again in future (just as I’ve never included them in past published inequality/Futoshiki puzzles). The rules of Inequality Sudoku are pretty simple – just place the numbers as you would in a regular Sudoku (or regular Jigsaw Sudoku in the 6×6 case), but obey the less-than (”<”) and greater-than (”>”) signs between squares. These indicate that the value of the number in a square is either less than or greater than its neighbour. And that’s it!